We just launched the Healing Hands website so check it out! They have an integrated an E-brochure on their site, navigation, click on categories, drop down repeat menus, interactive diagrams, along with a professional layout to best serve their clients! Don’t Trust Your Body to Just Anyone! 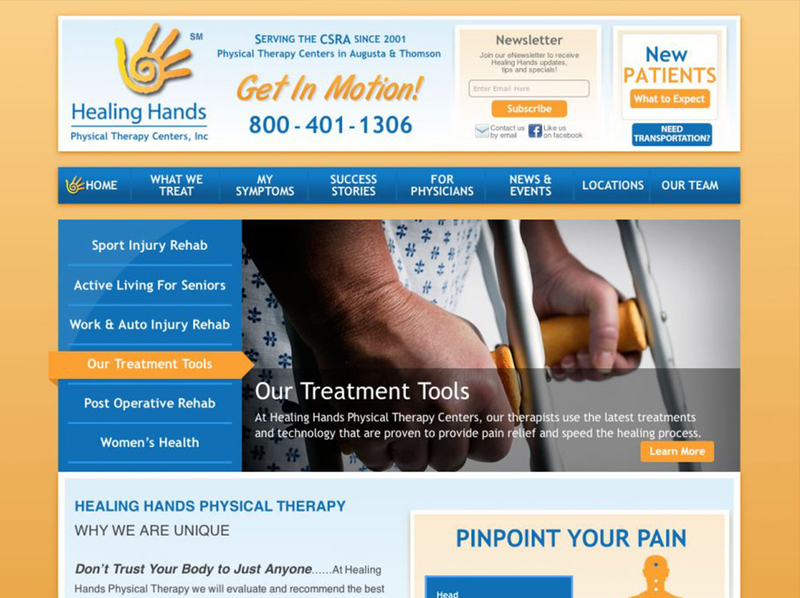 Check out Healing Hands and see how they can help you! At Healing Hands Physical Therapy they will evaluate and recommend the best treatments for your condition. The therapists are experienced and specialize in therapies for injuries, post-surgery and most medical conditions. They relieve pain and restore movement through touch, movement, cold laser light, physical exercise, therapeutic massage and deep muscle stimulation. For children, adolescents and adults of all ages, Healing Hands Physical Therapists help you Get in Motion quickly and as pain free as possible! Do you or your company have the website you need to best represent your business? Let us help.